Opt1 Vegan: Lahanodolmades/Savoy cabbage dolma stuffed with rice, bulgur, herbs, pine nuts and walnuts with lemon sauce. Opt2 Meat: Bekri Meze, pork cooked in wine served with bulgur. Salad for both options: Roasted butternut pumpkin and fennel on a bed of rocket leaves, dressed with Greek Extra Virgin Olive Oil, topped with almond flakes. Greek herbal tea or filter coffee. The cost for the supperclub is £50 per person and you get all of these delicious dishes on your plate. Portions are Greek and generous, all dishes are home made, apart from the GAEA olives and roasted ramiro peppers. BYOB! Limited space so if you want to book for your party or just yourself, get in touch soon to arrange for your payment. (Vegan option available, let me know upon booking which of the two options you wish to have regarding your main). We start at 7:30pm and finish a few hours later, so if you want to stay for the 12 o’clock midnight and change of the year you’re welcome, but if you want to move on and party around in Shoreditch or walk to the Thames River for the fireworks that works too. Only free range and/or organic meat is used and Extra Virgin Greek Olive Oil. Our yeast is organic and so is most of the vegetables and spices used in the meal. Advanced payment only, £50 per person, all food included, you only bring your own drink. First come first served, as there is limited space book early to avoid disappointment! Location: We’ll be in between Old Street and Liverpool Street with good links 24/7 to all parts of London, exact address is disclosed upon payment only and closer to the date of the NYE supper 2013. Press and testimonials: Your chef Elisavet, devoted to Greek food, has received much acclaim for her traditional home-cooking style. Elisavet’s food has been served at Riverside Studios in London for a Greek festival and she has been featured in Red Magazine (June 2010), Foodepedia and ITV’s Britain’s Best Dish where Michelin starred chef John Burton Race said her lagana bread is “absolutely first class” and the prawn dish she cooked live on ITV was “cooked to perfection!” Also Eating East has given her food and supper club 4**** stars out of 5 in their review: http://www.eatingeast.co.uk/2010/09/22/greek-foodlovers-supper-club-2/ Elle Decoration magazine (September 2011) recommends Greek Cookery Classes as the authentic Greek cuisine experience and Business Traveller US magazine lists both her Greek Supper Club and Greek Cookery Class among London’s top alternative dining places. Elisavet is also the first cook to teach Greek Cooking lessons at Divertimenti Cookery and Leith’s Cookery School in London and her piece on Greek food in Greece was published in The Guardian. A thank you to Kenwood and Gaea for sponsoring with their products. Looking forward to seeing you soon! And if you can’t make it, Happy New Year, full of health, love and prosperity to you and those you love! We’re bringing back the popular Greekfoodlover’s New Year’s Eve Supper Club on 31 December, where I’ll be cooking all the food and you’ll be sitting down eating a feast of Greek mezedes and lots of other Greek delicacies at our dinner on New Year’s Eve. We’ll start at 7:30pm and finish after midnight when you can continue celebrating somewhere else if you wish to go on partying. So if you want to spend an evening with great Greek food and good company, this is the place where you can eat and socialise on New Year’s Eve without being rushed off your seat! The cost for the supperclub is £50 per person, menu will have an all vegan option or meat option, please advice upon booking. The finer details have not been set yet, but there will be 3 starters, a salad, a main and 2-3 desserts, including the traditional Greek Vasilopita and melomakarona! 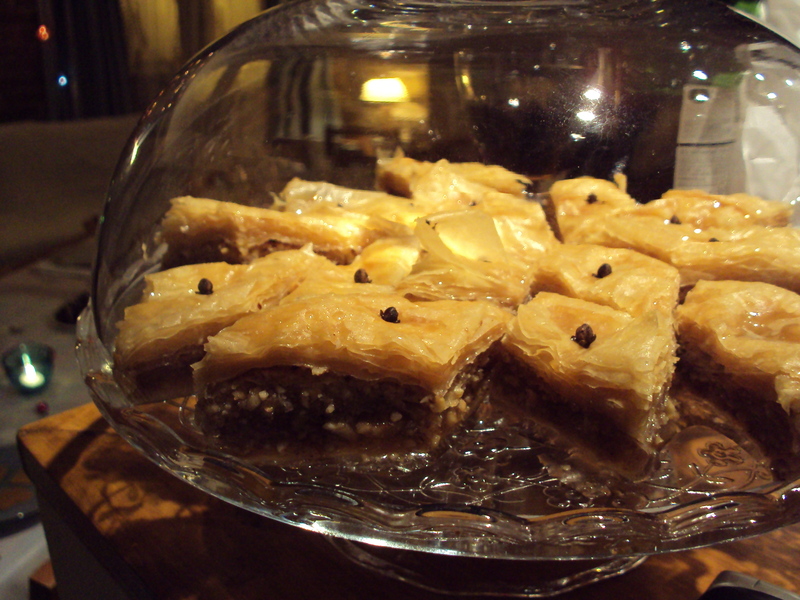 Price is £50 per person, portions are Greek and generous and all dishes are home made! BYOB! Limited space so if you want to book for your party or just yourself, get in touch soon to arrange for your payment. (Vegan and vegetarian options available, let me know upon booking, gluten free option as well though some of the traditional desserts are not gluten free). All meat, dairy and eggs although I cook a lot without dairy and eggs are free range and organic, all flour is organic too, and the majority of the ingredients including vegetables and spices. This is the perfect NYE dinner where you can arrive on your own, as no one sits by themselves or bring your partner and friends too! We all sit together around a big table, in an intimate and warm Greek atmosphere! Beyond cooking – giving food and warmth! Since this summer we are a small group of women in the UK and the rest of Europe who have collected clothes, toys, shoes, medicines and food to send to…… Greece! Yes, Greece in Europe, where the need is extreme for warm clothes, food and money to pay for heating. There is a small town in Northern Greece, in Makedonia, called Drama; a charity there gives clothes, food and helps poor families and homeless people who have no money for basic healthcare, food, or heating. They were initially helping abused women and children but have stretched out to help more people in need as the crisis in Greece has left many without jobs and without a home. If our boxes help a family give food and warmth for their children instead of sending them to the orphanage, then that is a small step forward, though more work needs to be done. But it’s a start. This is the first effort, I am doing, to organise a group of us to collect, money, clothes and food to send for a good cause. If all goes well I will try and arrange another collection of clothes and food parcels. There is a lot of help in the bigger cities like Athens and Thessaloniki, but the resources are fewer for the small towns out in the country and they need our support too. So far we have approximately 20 boxes that will be transported from UK to Greece, I have found a company to do the transport of all our boxes free of charge. I now need to find transport from Amsterdam and Germany, but hopefully it will be arranged, we are working on it. There is a money collection going on as well. I am just really saddened and angry with what is going on in Greece the last few years, I have heard too many stories of healthy people who have taken their lives, or plan to, because they have no means of making a living and put food on their table. People have been stolen of their dignity and rights to work and to earn a decent living and to provide shelter and food for their children. The Greek government has since long ago on purpose forgotten its citizens, disregarded them, their focus is how to save money and ignore how young people die of hunger, racist violence and suicide. It breaks my heart each time I hear children being dropped off at the orphanage, because parents cannot afford to feed them..
A warm big thank you for those who have packed up your clothes, children’s toys and bought some food, soap and toothpaste to be sent off. Your thoughts and help is much appreciated and needed, and will put smiles on people! Our melomakarona are made with organic flour, extra virgin Greek olive oil, Greek walnuts from Carpo, organic brown caster sugar, organic Greek honey, Metaxa brandy and organic oranges. You can order by piece or larger quantity. If you want a big order place it in time! 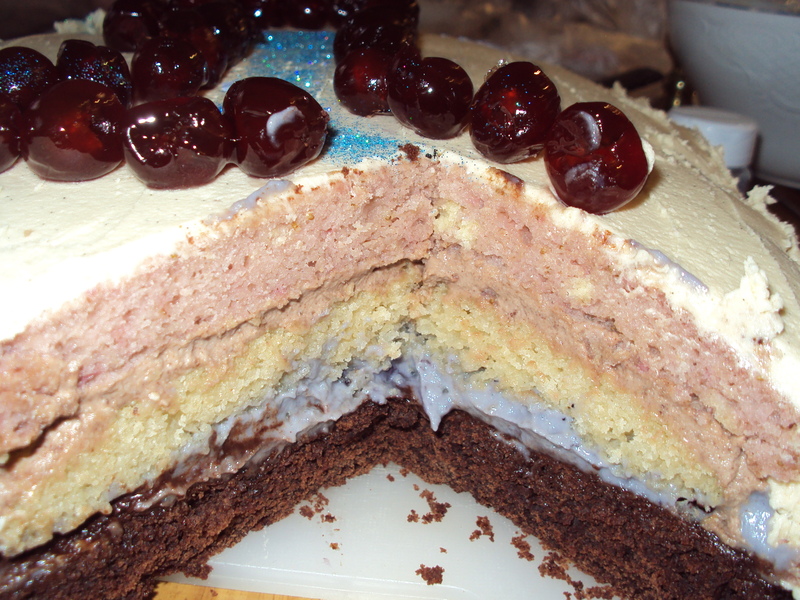 Vegan and gluten free cake with natural food colourings! I love dessert! The Greek cuisine has a lot of sweet cakes and desserts and once I started following a vegan diet more religiously, I was afraid I’d never see a cake again and be able to eat it. Luckily I was wrong, very wrong! 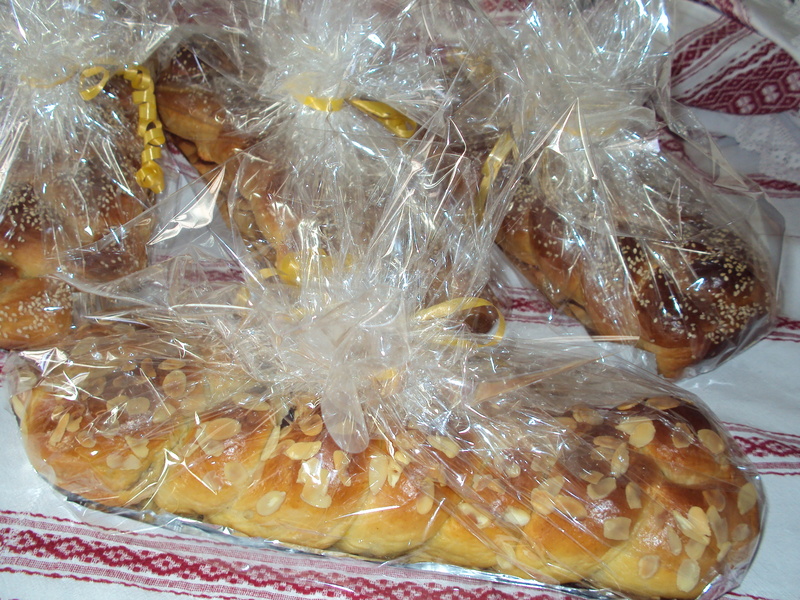 So far I’ve made halva, mpougatsa me krema, baklava, walnut cake, brownies and apple pies all vegan and soya free. 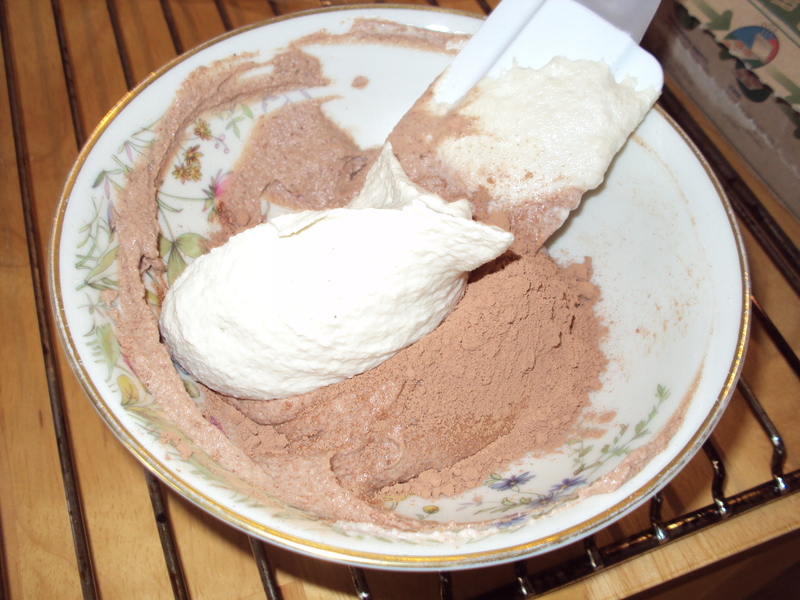 While I’ve been doing vegan desserts for a while now, most of the time I have been using spelt flour. Now for the first time in a long time, I decided to try and make a cake which was both going to be vegan and gluten free! Not easy! Not easy at all! 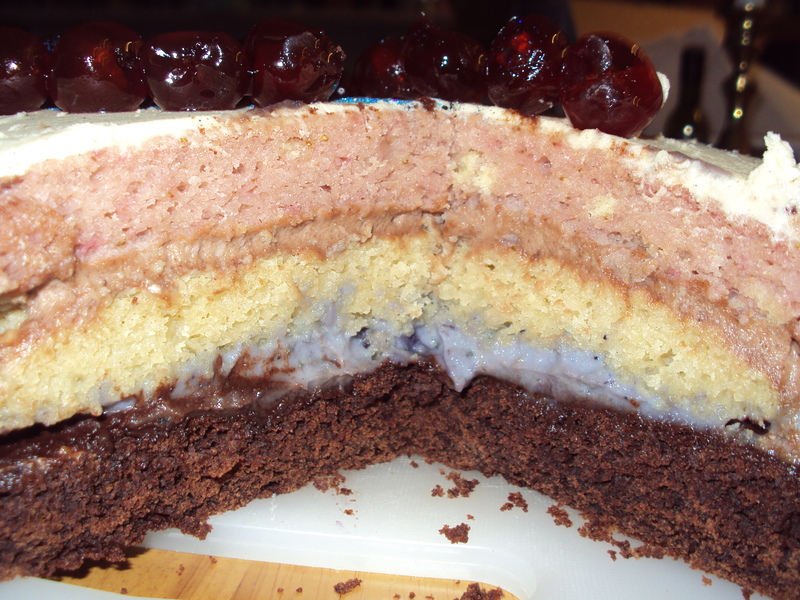 A few years back I made a gluten free cheese cake! That worked out fine as I could use eggs and cream cheese and still achieve the natural cheese cake flavour. So to my help this time, as I am not a gluten free expert, I used Ms Cupcake’s The Naughtiest Vegan Cakes in Town, a dessert and cake book that just came out last week! It is a great guide to learn how to make vegan icing. I normally would stay clear from dairy free spreads as I use extra virgin olive oil for most of my vegan baking, yes, evoo, nothing else! But for icing, I am not sure evoo will do. Another thing I did learn and was inspired by Ms Cupcake, was to use foods to do natural colouring in my cake, instead of using food colourings which if they’re non-vegan may contain animal products in them and if they’re vegan they’re artificial with various E Numbers. So I used unrefined icing sugar, which gave my icing a slightly golden colour and that wasn’t my intention, but I know for next time! It tastes just as good, it’s just that crisp white snow effect that was missing, instead it’s more like a white golden sand, you can hardly tell from the picture though. What I loved was getting the pinkish coloured sponge from strawberries! I blended them in my mini Kenwood and alongside olive oil, these two where the only liquid ingredients I added in my mix to get the pink. The flavour of strawberry is divine, just natural hints of fresh hand picked strawberries that no essence will ever achieve. I’ve been using bananas, apples and nuts to bind my ingredients together in vegan baking, but never ever did it occur to me to bring in strawberries which not only added a nice colour but also taste. Now I wonder what would happen next time, if I added a bit of blended beetroot to the mix, would it intensify the red colour? I made a cream with cashews that I blended with a bit of water, maple syrup and vanilla sugar and then I mixed one part with blueberry conserve to get the blue colour and cocoa powder for the other part to get a chocolate flavoured cream filling! 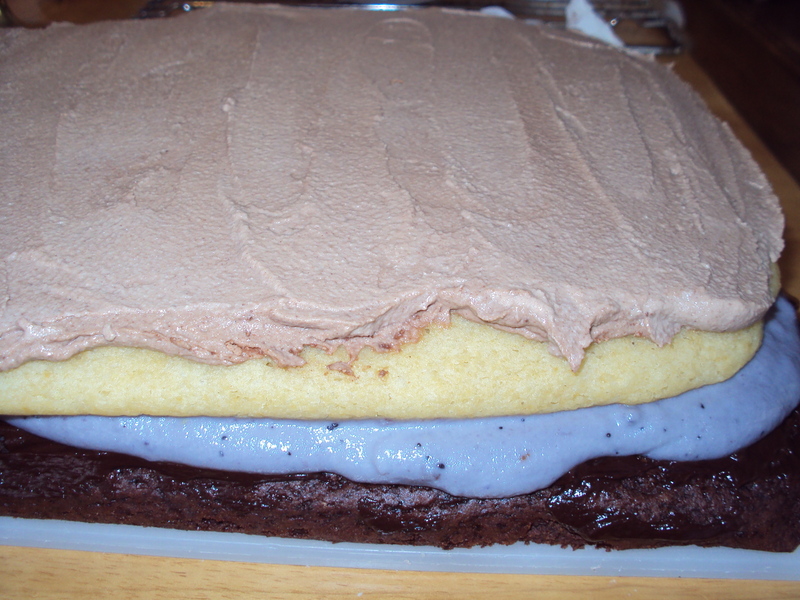 My one and only problem with this cake, yes it is a feast of colours, but this was a trial session to see what works and what doesn’t, but I found the sponge is not the same as when using flour or spelt flour, the gluten free self raising flour turned out to give a more dense base for my sponge and not the same flavour I expect from a cake’s base layers. I’ll do the cake again, but this time, vegan only, I don’t think I am up for the gluten free version, if I can’t use eggs and dairy! 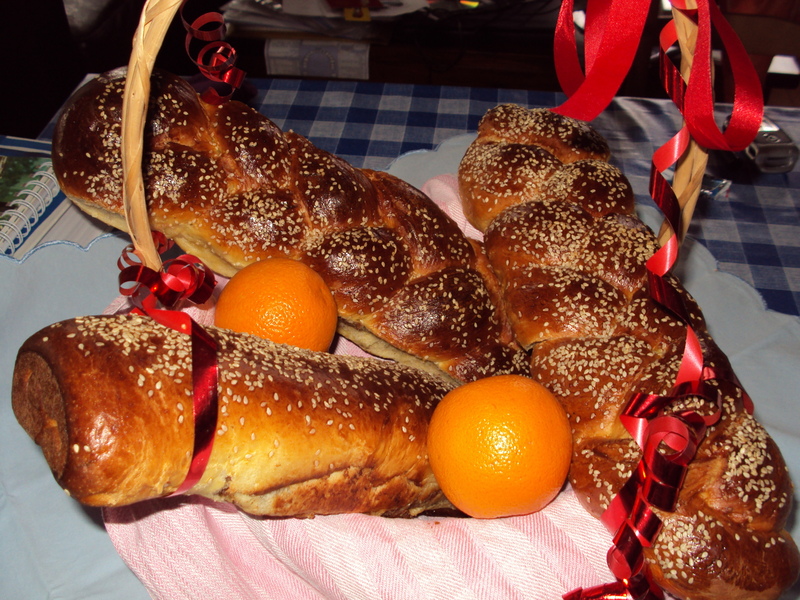 It’s Greek Easter this week, so if you have Tsourekia cravings for the yummy traditional Greek Easter bread, you can order some and collect later this week! 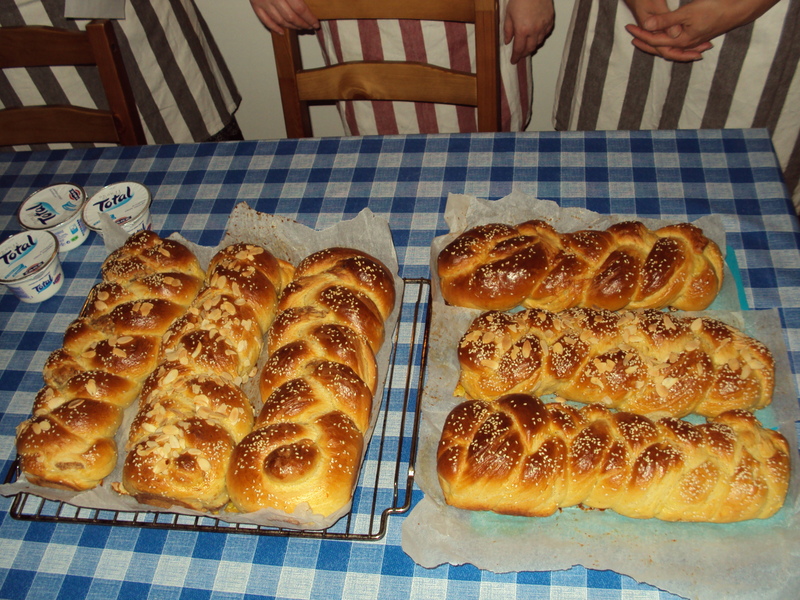 Our Tsourekia Greek Cookery Class is full on Thursday 12 April but if you still have Tsourekia cravings for this traditional Greek Easter bread, there is a possibility to order some and collect ahead of the Greek Easter next week! And earlier this week I was on BBC London talking about Tsourekia and Greek Easter food! If you missed it, here’s the link to the Robert Elms show http://www.bbc.co.uk/programmes/p00q2psm I’m on after 1hr and 24min for about 12 minutes, after the Gil Scott-Heron song. A thank you to Total Greek Yoghurt and Kenwood for sponsoring with their products. 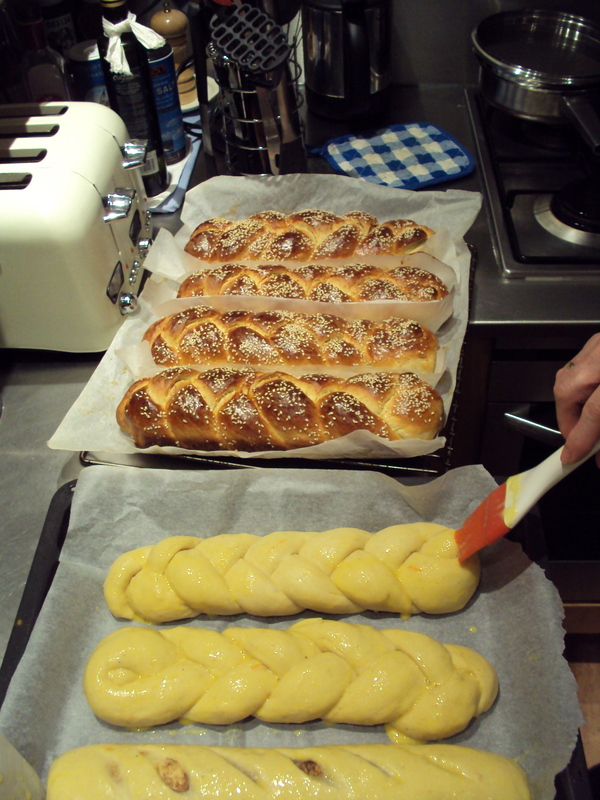 Anyone who is still interested in getting Tsourekia for Easter – and remember Greek Easter is this year a week later than the Catholic/Anglican/Protestant Easter – get in touch via greekcookeryclass(AT)gmail.com to place your orders!